41 mm 18-ct pink gold case, transparent back, sapphire crystal, black dial, BVL 193 automatic movement, approximately 50 hours of power reserve, black alligator strap, folding buckle with 18-ct pink gold. Water resistant to 330 ft.
41.5 x 47.4 mm including lugs 18-ct pink gold case, 10.55 mm thick, transparent back, screw down crown, diamond bezel set with 56 diamonds, sapphire crystal, black dial, BVL 193 automatic movement, approximately 50 hours of power reserve, black alligator strap, deployant buckle. Water resistant to 330 ft.
41.5 x 47.4 mm including lugs 18-ct pink gold case, transparent back, screw down crown, sapphire crystal, black dial, BVL 328 automatic movement chronograph and stopwatch, approximately 50 hours of power reserve, black alligator strap, deployant buckle. Water resistant to 330 ft.
41 mm 18-ct pink gold case, transparent back, sapphire crystal, brown dial, BVL 193 automatic movement, approximately 50 hours of power reserve, brown alligator strap, folding buckle with 18-ct pink gold. Water resistant to 330 ft.
41.5 x 47.4 mm including lugs 18-ct pink gold case, transparent back, sapphire crystal, brown dial, BVL 328 automatic movement chronograph and stopwatch, approximately 50 hours of power reserve, brown alligator strap, deployant buckle. Water resistant to 330 ft. The Bulgari trademark is usually written BVLGARI in the classical Latin alphabet, and is derived from the surname of the company's Greek founder, Sotirios Bulgaris who opened his first jewelry store in 1877 in Epirus Greece. He then moved to Italy and the flagship store remains to this day in Rome. The company's Swiss subsidiary, Bulgari Haute Horlogerie SA, is responsible for Bulgari watch production and was founded in 1980. Bulgari develops its own automatic and quartz movements and parts, including highly complicated chronograph mechanisms and basic calibers. 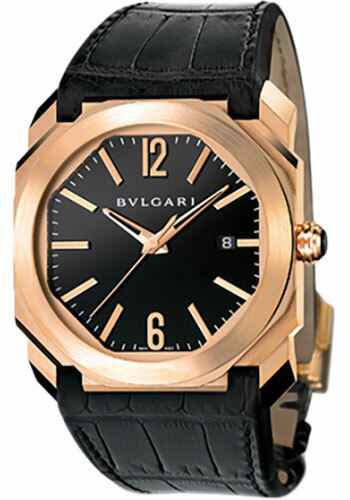 The Bulgari watch collection comprises the following styles: Bvlgari-Bvlgari, Octo Bi Retro, Endurer Chronosprint, , Astrale Cerchi, Serpenti, B.Zero1, Daniel Roth, Lucea , Rettangolo, Gerald Genta, Diagono and Octo. On 6 March 2011 French luxury group LVMH Moet Hennessy Louis Vuitton SA announced the acquisition of Bulgari SpA in an all-share deal for 4.3 billion euros, more than LVMH had offered for any other firm. SwissLuxury.Com sells authentic Bvlgari watches at discount prices and can also quote fine jewelry and diamond pieces as well.